Sony teases prototype 4K Ultra HD Blu-ray player | What Hi-Fi? 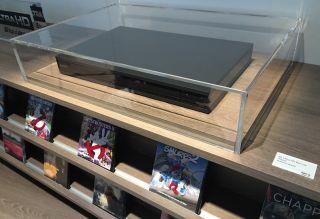 The first prototype of Sony Ultra HD Blu-ray player has been spotted at IFA 2016, and although Sony wouldn't divulge how close it is to a finished product, we're hoping it will be available before April 2017. Ever since Panasonic and Samsung launched their Ultra HD Blu-ray players, everyone's been waiting for Sony to make its move. After all, it was one of the most vocal supporters of the original Blu-ray format when the first players launched back in 2006. Finally, the company has now given a glimpse of what we could expect in the coming months by showcasing a prototype player on the Sony stand at IFA 2016. Although Sony was unwilling to confirm any details (the player doesn't even have a model name), all signs indicate a 4K machine is definitely on the way. But with no major announcement at IFA 2016, the next logical event for a launch would be next January at CES 2017. We've been big fans of Sony's Award-winning Blu-ray players in recent years, so it's going to be interesting to see what features the new 4K player includes. Will it double as a hi-res audio and SACD player like the Sony UHP-H1? Then there's the question of price. Just yesterday Panasonic announced the DMP-UB700, a new £400 Ultra HD Blu-ray player, so we wouldn't be surprised to see Sony's new player arrive with a similar midrange price tag.